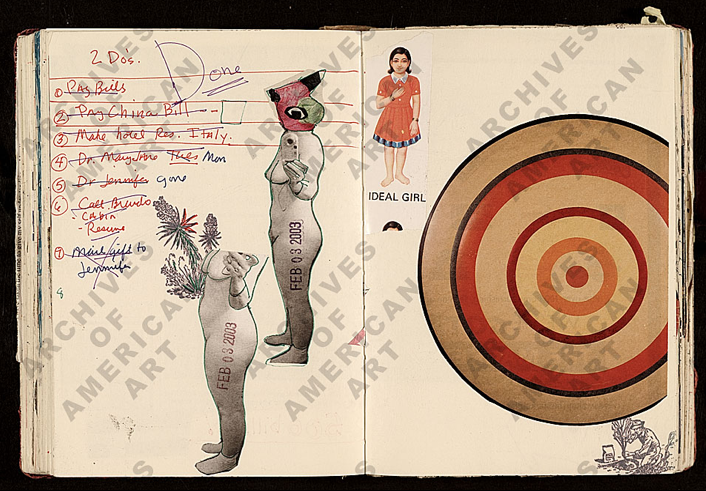 Adolf Konrad's graphic packing list, Dec. 16, 1973. Adolf Ferdinand Konrad papers, 1962-2002. 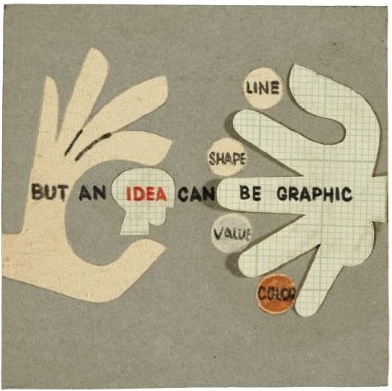 Image courtesy of the Smithsonian Institution's Archives of American Art; copyright F+W Media Inc. 2011. We've previously taken a voyeuristic look inside the notebooks and sketchbooks of great creators and, today, we turn to an even more private facet of the creative self: the list. Lists: To-dos, Illustrated Inventories, Collected Thoughts, and Other Artists' Enumerations from the Collections of the Smithsonian Museum offers a surprisingly intriguing glimpse of some of the 20th century's most remarkable creators—including Pablo Picasso, Joseph Cornell, Willem de Kooning, Mark Rothko, Andrew Wyeth, and Janice Lowry, among dozens of others—revealing their personal habits, priorities, and decision-making schemata through the lens of the seemingly mundane. 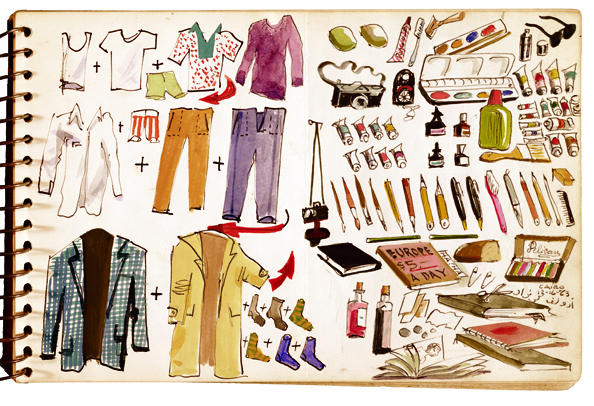 In the process, the book demystifies art-making and the creative life. 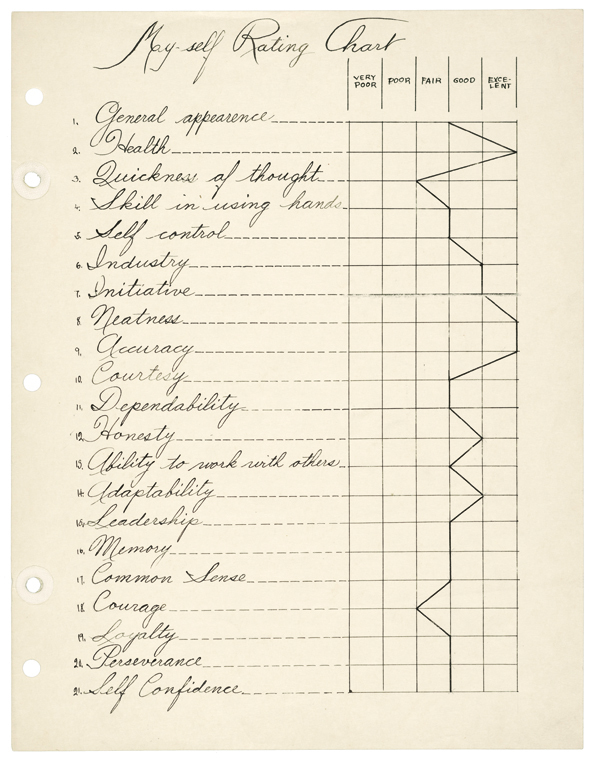 From a list Finnish-born architect Eero Saarinen made of his second wife's positive attributes, to designer Harry Bertoia's 1932 self-rating chart for a school assignment, rating 21 of his characteristics on a spectrum from Very Poor to Excellent, to Picasso's recommendations of artists he liked for Walt Kuhn's 1913 Armory Show, these wonderful and fascinating 70-or-so artifacts reveal as much about their creators as they do about the values, fixations, and points of interest of their respective eras. 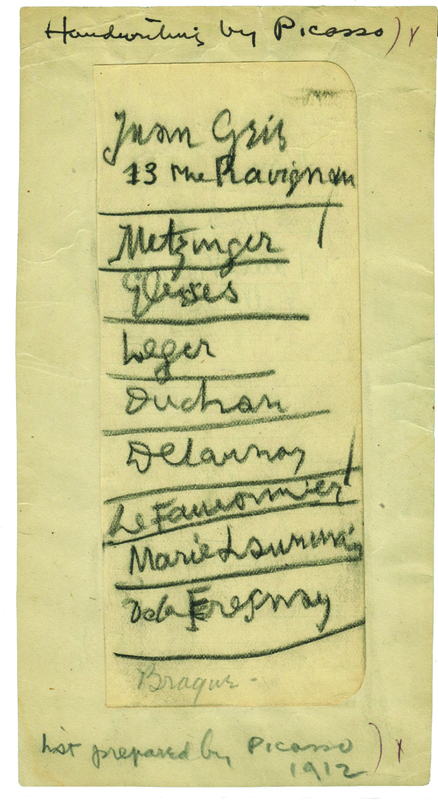 Eero Saarinen's list of Aline Bernstein's good qualities, ca. 1954. Aline and Eero Saarinen papers, 1857-1972. 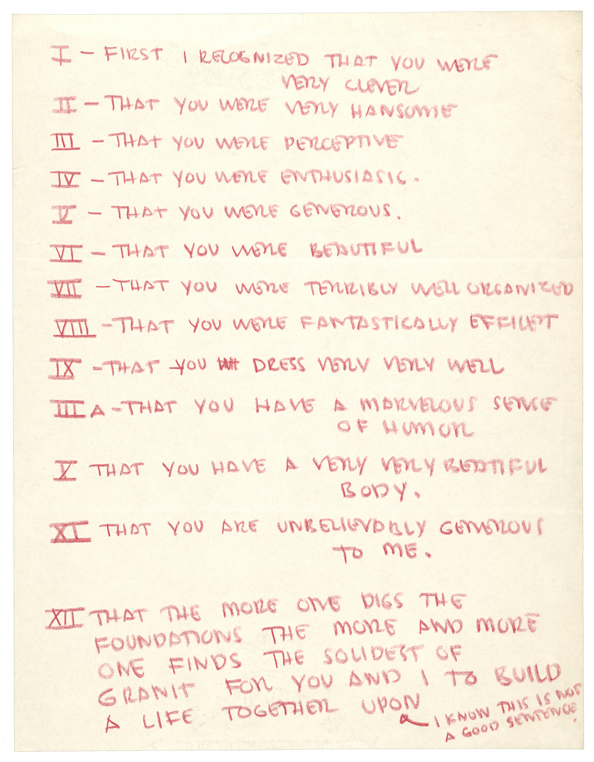 Harry Bertoia's 'My-self Rating Chart' school assignment. Harry Bertoia papers, 1917-1979. 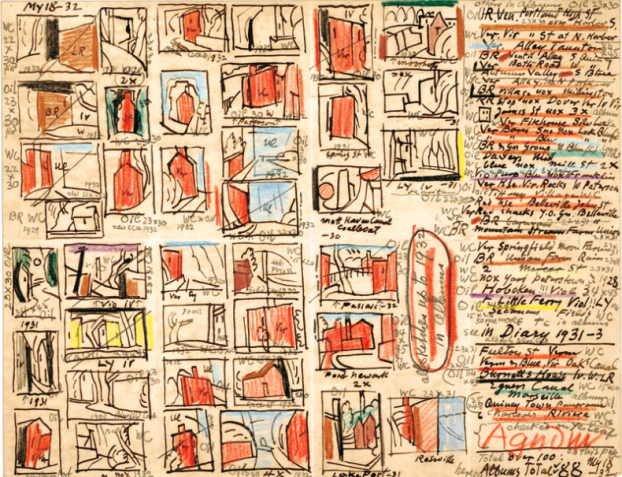 Pablo Picasso's recommendations for the Armory Show for Walt Kuhn, 1912. Walt Kuhn, Kuhn family papers, and Armory Show Records, 1859-1978. Janice Lowry's Journal #98, 2002-2003. Image courtesy of the Archive of American Art. 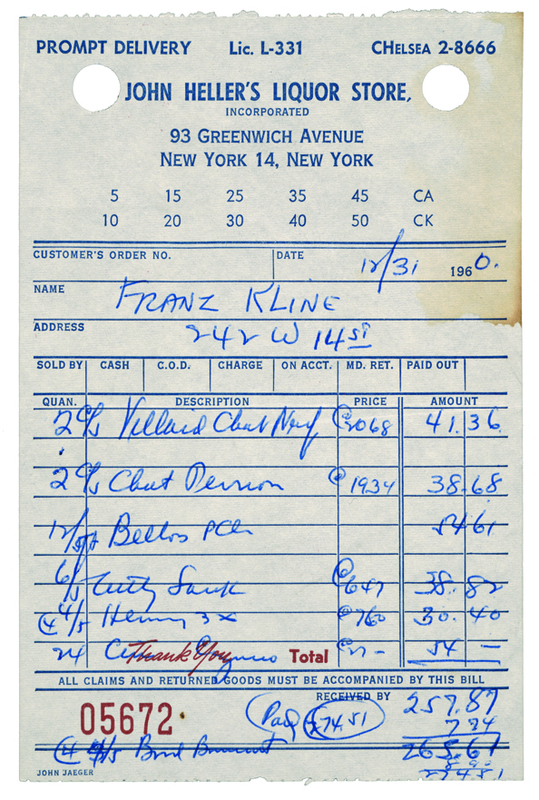 Franz Kline's receipt from John Heller's Liquor Store, Dec. 31, 1960. Elisabeth Zogbaum papers regarding Franz Kline, 1928-1965. Lists comes from Princeton Architectural Press, purveyors of the visually compelling and culturally intriguing. Original images from the book are currently on display at the Morgan Library & Museum in New York until October 2, 2011.